MERAFE Resources paid a six South African cents final dividend, taking the total dividend for the 2018 financial year to 14c/share or R351m, and said it wasn’t impossible to imagine a 100% earnings pay out in the future. However, it identified price pressure on chrome pricing and the potential impact of significant power outages from Eskom as key risks to the current year’s performance. The 2018 dividend was a 16% year-on-year increase. This was despite a weaker performance by Merafe in 2018. The ferrochrome price remained as volatile as ever despite growth in stainless steel production in 2018, expected to be about 6.1% higher. The European benchmark price for the metal bounced between $1.40 per pound ($/lb) and $1.20/lb for most of last year trailing off disappointingly in the final quarter although there had been a slightly recovery during the first quarter of this year. “We would like to keep about R50m in cash at the Merafe head office level and R150m in the joint venture. 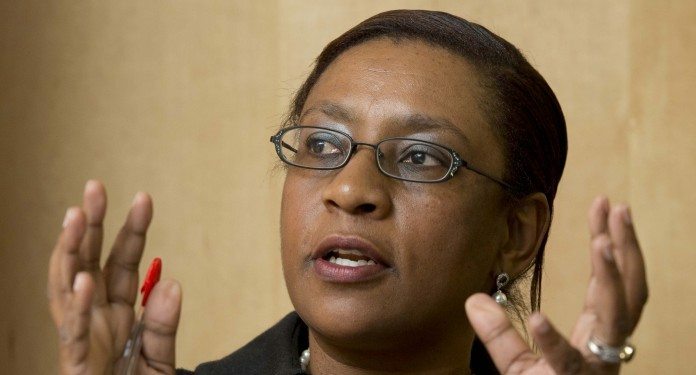 In theory a dividend representing 100% of earnings could be possible but it would depend on a number of factors,” said Zanele Matlala, CEO of the company in a full-year results presentation today. The proposed 2018 pay out was equal to 51% of headline earnings compared to a dividend in the 2017 financial year of 33% of earnings. Merafe, which has a 20.5% share in earnings before interest, taxation, depreciation and amortisation of a joint venture with Glencore-Merafe Chrome Venture, had cash as of December 31 of approximately R282m down from R672m. The year-on-year decline was partly owing to an increase in working capital. Madlala said the company had produced more than it had sold and would release metal, currently at five months of supply compared to the preference for four months, as and when it was deemed sensible. The company had also repaid its debt and was net cash positive. “We expect to bring some relief in the year,” said Madlala of the increase in metal inventories – a development put down to a delay in shipments. “The delay in shipments was due partly to interruptions in railing at Richards Bay in December.” A rail line was cut in an event described by Transnet, the state-owned transport utility, as an act of sabotage. Madlala said Eskom remained a concern. “Given the amount of electricity we use from Eskom it is not possible to replace it,” the company said. “However, we do attempt to mitigate it,” it said, adding that co-generation and other techniques were being assessed by the company. The National Energy Regulator of South Africa last week approved a tariff hike for Eskom of about 13.8% a year for three years. The increase in the tariff was described by the Minerals Council South Africa as damaging to the sector, especially marginal miners in the gold industry. All in all, headline earnings were down a quarter year-on-year at some R27.2c/share with the rand firming in the second half (70% of foreign exchange gain was in the first half of the year) while electricity costs increased in the second half. Output of ferrochrome totalled 407,000 tonnes compared (2017: 395,000 tonnes|). Demand globally grew to 13.1 million tonnes (21.2m tonnes). You okes need to getting your spelling together. Clearly lack attention to detail.